Grove Isle is a private, gated island located on Biscayne Bay just 3 miles south of Downtown Miami. Grove Isle Bridge links the island with the mainland. Built in the late 1970s, the Grove Isle Bridge had been exposed to aggressive chlorides from seawater. Severe corrosion damage was observed on the underside of the deck. Some spalling was observed, and preliminary observations indicated heavy damage to the prestressing strands and conventional reinforcement. The general contractor responsible for making repairs to the ends of the bridge where the cover had degraded, observed major corrosion and informed the owner that based upon the corrosion found, it was likely that the full length of the span was equally corroded and that significant reconstruction could be necessary. In addition to the inconvenience to the Island’s residents, chipping the middle span would have an important environmental impact and would be complicated and costly to manage. To ensure that repairs would be effective, SIMCO was called in to conduct a condition assessment and to provide expert guidance and recommendations for the efficient repair and rehabilitation that would extend the service life of the bridge. SIMCO was hired by the Board of Directors and the Capital Improvement Committee of Grove Isle Condominiums to conduct a comprehensive investigation including a visual inspection and corrosion measurements, evaluation of chloride contamination levels on selected areas to determine the extent of corrosion damage and residual service life as well as to identify an effective and efficient rehabilitation strategy. 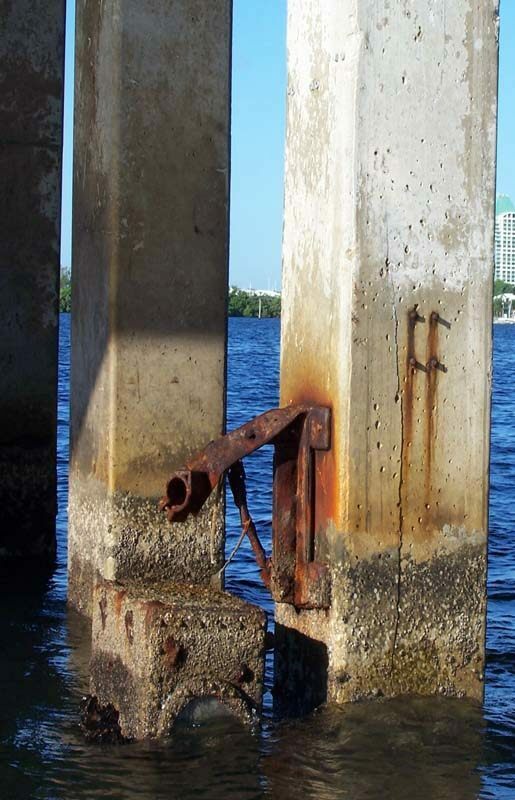 Visual observations, corrosion measurements, and chloride profiles all indicated two distinct levels of deterioration on the bridge, and correspondingly, two levels of chloride exposure. The bays located near the bridge ends were found to be severely damaged by corrosion of the reinforcement, while the bays at the center were in fairly good condition. Corrosion measurements suggested that corrosion damage could be expected in approximately 10 to 15 years for most of the center locations tested. Higher corrosion rates were measured towards the ends, where corrosion damage could be expected within about 2 to 5 years. 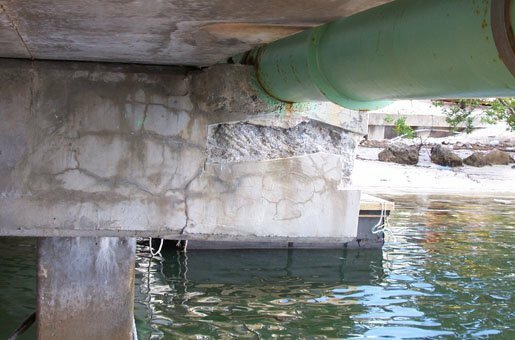 Results from analyses conducted also suggested that the corrosion damage observed was mainly caused by poor quality concrete that failed to protect the steel reinforcement, and not entirely by severe exposure conditions. SIMCO helped to extend the service by 30 years with minimal environmental impact and minimal disruption of service at 50% of the cost of rehabilitating the entire bridge.